Q1. What is Adaalo Premium Ad? Ans. 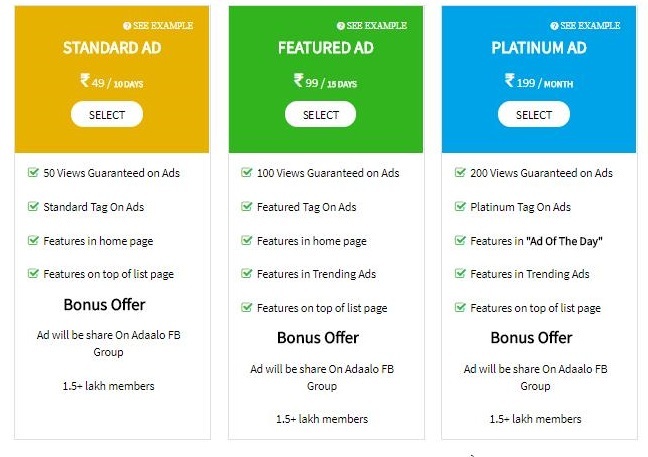 Premium Ads is a premium (paid) service from Adaalo which allows you to display your Ad in a designated area and highlight your Ad giving it better visibility by reaching out to more consumers and selling your product or service faster. Q2. What is the benefit Adaalo Premium Ads? Q3. How do I opt for Premium Ads? a. At the time posting a new Ad, you will get an option to sell 5 times faster. Choose your prefered option from there. Q4. What are the different types/plans of Premium ads? Q5. What are the modes of payment? a. Credit card, debit card, net banking, Wallet, etc. Q6. How does a Premium Ad look like and where can I see it? a. Premium Ads appear on the top of the search results in a separate section. b. Premium Ads also appear under "All Ads" with a highlighted background. c. All Premium Ads contain a “Premium” tag. d. The Premium Ads appear basis the location and sub-category opted by the user. Q7. How soon does my Premium Ad appear on Adaalo, upon making the payment for it? Ans. The Premium Ad appears on our site within 3-6 hours of making the payment and upon meeting the requirements of our Posting Rules. Q8. How long does my Premium Ad remain live on Adaalo? Ans. The Ad will remain active as Premium Ad on our site for the period for which you purchase it. Q9. Can I cancel the Premium Ad, once I have made the payment? Ans. Yes, the Premium Ad can be cancelled/deleted by you once the payment is made however, payment made will not be refunded. Q10. Can I edit my Premium Ad? Ans. Yes, you can edit your Premium Ad via “My Ads” just like a normal Ad. Q11. Can I renew my Premium Ad? Ans. Yes! If the Premium Ad duration has lapsed and your Ad is still active, you can avail the option of Premium Ad for the remaining duration of your Ad. Go to “My Ads” , and you will find an option to upgrade Ad to a Premium Ad. Q12. Can I get a refund for my Premium Ad? The payment made for Premium Ad is non-refundable. It will be refunded only in case of technical issues or in the instance of deletion of the ad by Adaalo at the time of review (within 24 hours of it being posted) due to violation of our Posting Rules or miscategorization of the ad. Q13. Do you have Premium Ads for all categories? Ans. Yes, Premium Ads are available for all categories. Q14. Can I upgrade my existing Premium Ad? Ans. A Premium Ad once availed, cannot be upgraded prior to its expiry. Ex: If you have an existing Featured Ad for 15 days, you cannot further avail another 15 days or upgrade to 30 days prior to lapse of initial 15 days. Q15. How can I track the Premium Ads that I have purchased? Q16. Can I continue to post free Ads on Adaalo? Ans. Yes, you can continue to post free ads on Adaalo. Hope the above information has been helpful in better understanding how Adaalo’s Premium ads work. If you have any other question or need any help, please write to us at support@adaalo.com and we will get back you soon.